Splendor Koi and Pond is Atlanta’s one stop koi and pond shop. We carry the highest-quality products on the market, and will never sell you something that we wouldn’t use in our own ponds. 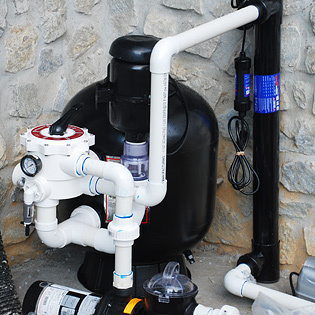 Our selection of products includes pond and water treatments, fish medication, algae control, pond construction and plumbing equipment, filtration systems and accessories, pumps, UV filters, leak repair kits, plants and planting accessories, pond decor, and much more. No matter what you may need for your pond or water feature, chances are we have it! Filtration Systems • Water Treatment • Dechlorinator • Bacterial Supplement • Koi Medication • Fish Food • Pumps and Accessories • Waterfall and Skimmer Boxes • Fish and Leaf nets • UV Lighting Systems • Plants • Plumbing Equipment • Planting Equipment • Filtration Media • Algae Treatment • Lighting • Aeration • Top-Quality Japanese Koi and other pond fish • And much, Much more! API • Aqua Control • Laguna • Firestone • Savio • Pondmaster • Matala • Microbe-Lift • Tetra Pond • Blackwater • KoiRX • Blue Ridge • …and much more. 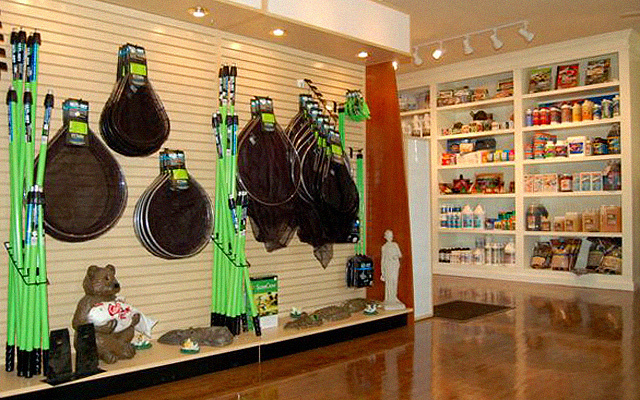 Come visit our state-of-the-art showroom today and we will help you find exactly what you need to keep your pond or water feature happy, healthy and beautiful. 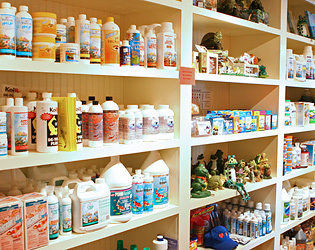 If you are looking for something specific, call us at 770-321-FISH and we can see if we have it in stock. If you need something that we don’t have, we can order it specifically for you.